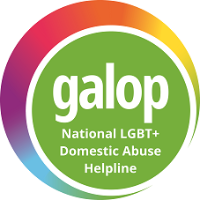 Galop’s National LGBT+ Domestic Abuse Helpline provides emotional and practical support for LGBT+ people experiencing domestic abuse. Abuse isn’t always physical - it can be psychological, emotional, financial and sexual too. Speak out, don’t suffer in silence. On Tuesdays, between 1pm - 5pm the helpline offers a trans specific service.